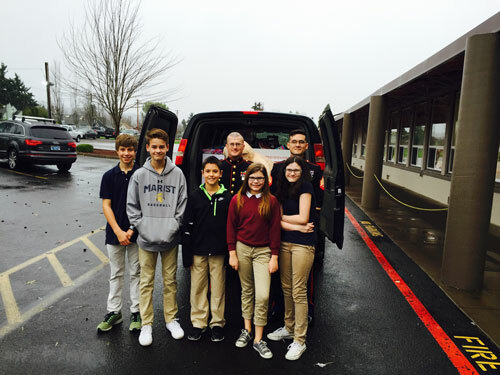 EUGENE — In what has become a tradition, O’Hara Catholic School held a Christmas toy drive for Toys for Tots. For three weeks in November and December, O’Hara staff, students and families filled collection boxes to help local households in need. For the last three years, O’Hara has been the largest private collection location for the local efforts, collecting around 350 gifts each year. U.S. Marine Corps Staff Sergeant Thadd Pooler, coordinator of the local Toys for Tots drive, challenged O’Hara to an increase this year. The school rose to the challenge and donated 427 toys to the cause.